Fossil Bay Resort is located on Vancouver Island, about 60 km (37 mi.) west of Victoria BC. Vancouver Island can be reached by car ferries, by passenger ferries and by air. BC Ferries operates car ferries between Tsawwassen and Swartz Bay. If you want to avoid possible waiting times it is advisable to make a reservation. Generally, ferries are scheduled to run in one hour intervals in summer and two hours intervals in winter, starting at 7 am until 9 pm. Washington State Ferries runs one or two car ferries a day between Anacortes, WA and Sidney, BC, except for the winter months. It is also advisable to make reservations. Black Ball Ferry Line operates the M.V. Coho between Victoria BC and Port Angeles WA on the Olympic Peninsula. As this route is also often very busy it is a good idea to make a reservation. Victoria Airport is served by Air Canada, WestJet, United Express and several smaller airlines. International flights with most major airlines can be booked to Victoria, usually either via Vancouver or Seattle. Air Canada, which is a Star Alliance member, offers direct flights from several Canadian cities. Harbour Air offers flights between Victoria and Vancouver harbours, and Kenmore Air flies between Seattle and Victoria Inner Harbour Seaplane Base (YWH). HeliJet Airways has regular helicopter flights between downtown Vancouver, Vancouver International Airport and the Victoria harbour. All car ferries accept also foot passengers, but there is also a passenger only ferry to Victoria: Victoria Clipper operates year round high-speed catamarans between Seattle's Pier 69 and Victoria's Inner Harbour. In spring 2016 Victoria Clipper will also add a ferry service between Victoria and Vancouver. In summer 2016 Riverside Marine will also start a ferry service between between Victoria’s Inner Harbour and Vancouver’s Harbour Flight Centre in Coal Harbour. Vancouver Island can also be reached by car ferries to Nanaimo, Comox,and Port Hardy, as well as by air travel to Nanaimo and several other smaller airports. For detailed driving directions to Fossil Bay Resort please click the appropriate link which will open Bing Maps in a new window. Please wait for the window to build up. Beware: Most GPS do not work in the Shirley - Jordan River area! There is no gas station west of Sooke, so make sure you have enough fuel! Avis, Budget, Hertz and National Car Rental have counters in the arrival area. Avis, Budget, Hertz and National Car Rental have offices in downtown or midtown locations. 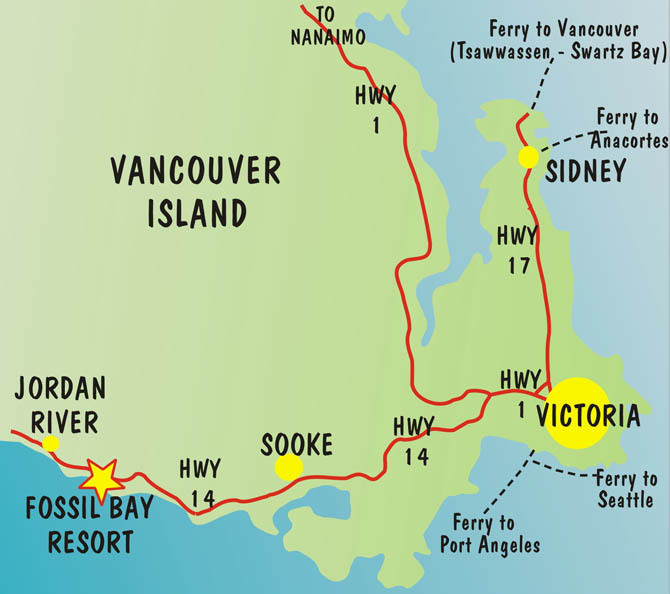 To visit Fossil Bay Resort without a car, one can take a bus to Sooke and then a taxi for the last 25km (Sooke Harbour Taxi 250-642-7900). For detailed information about public transportation in Greater Victoria consult the website of BC Transit. Tourists using charter flights arrive at Vancouver Airport. Most will book a connector flight or rent a car in Vancouver, but there is also the possibility of taking a BC Ferries Connector bus, which leaves several times daily just outside the international arrival area to downtown Victoria. When visiting Canada, a traveler has to fulfill certain requirements and follow the Canadian rules for the importation of goods. For information about the needed travel documents for citizens of a specific country visit the website of the Canadian embassy in this country. All visitors to Canada (except US citizens or US permanent residents coming directly from the US) require a passport and citizens of a number of countries need also visas to enter Canada. US citizens and lawful permanent residents travelling by land find information about the Canadian requirements at the website of the U.S. Department of State and about re-entry to the USA at the website of the U.S. Customs and Border Protection. There are a number of restrictions concerning the importation of goods. A comprehensive overview, as well as other information for visitors can be found on the website of the Canadian Border Services Agency. Tourists are allowed to operate a motor vehicle in Canada if they have a foreign drivers license. It is important that you become familiar with Canadian traffic laws. For more information about traffic regulations in British Columbia consult the BC Motor Vehicle Act. For current driving conditions you may want to consult the website of DriveBC.ca.